I'm curious about the amount of collaboration between major, and not so major, genealogy repositories. How much is there? Is there enough? I know we can't make all of the people happy all of the time (I'm speaking for myself here for sure). However, I do believe in the power of numbers and that reaching more people creates the potential for more happy people. I also believe that cannibalism leads to fewer happy people. What in the world? How am I equating cannibalism with genealogy repositories? I will tell you. 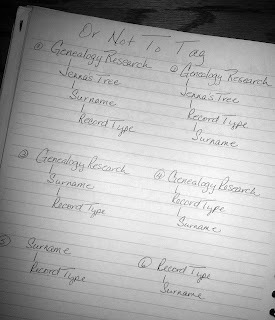 I recently attended what should have been a major event at a well-known, state-of-the-art genealogy library. However, on that very same day a federally operated repository right across town was also hosting an event. The result was they both lost out on attendance and exposure. They cannibalized each other. How do things like this happen? Did somebody try to reach out to the other and they just couldn't get other dates to work? Did nobody reach out because they are a "competitor" and think "why would we try to work with them?" Or did nobody even think to reach out? Let's say they didn't want to reach out, for whatever reason, did they try to research online to see what the other repository is doing? Did they visit an event aggregator such as Conference Keepers to see what is listed and make sure their event is listed? Maybe they did. Maybe their hands are tied by some old-school, out-of-touch marketing director who thinks collaboration is "tipping your hand." No matter the circumstances of how things played out, it's an interesting situation. I'm seeing more and more event options that overlap and/or are scheduled on back-to-back weekends that create conflicts. If that's how it has to be fine, I just want to know that someone actually put some thought into it. Genealogy and History Data Updates June 17 - June 23, 2013. I've been reviewing my Notebook and Tagging system in Evernote recently with the hope of collapsing my hierarchy as much as possible. During that process I began to wonder about my windows hierarchy as well. In Evernote I've been good about limiting my folders and relying on tags more and more. The search feature in Evernote is very powerful and finding what I need has not been a problem with this method. I did however start to notice redundancy and even unnecessary folders that I'm working to eliminate. Once I started looking at my windows folder system I realized my job there was much larger. I had originally started with a folder for each surname then a folder within the surname for each type of record. One of my record types is Deaths. When I search for Deaths I get 229 folders called Deaths. I don't think I need 229 folders with the same label. The more time I've spent looking at this, the more I'm inclined to flip-flop my thinking. Wouldn't it make more sense to have one folder labeled Deaths with all my surnames in that folder? Better yet, just a folder labeled Deaths with no sub-folders. 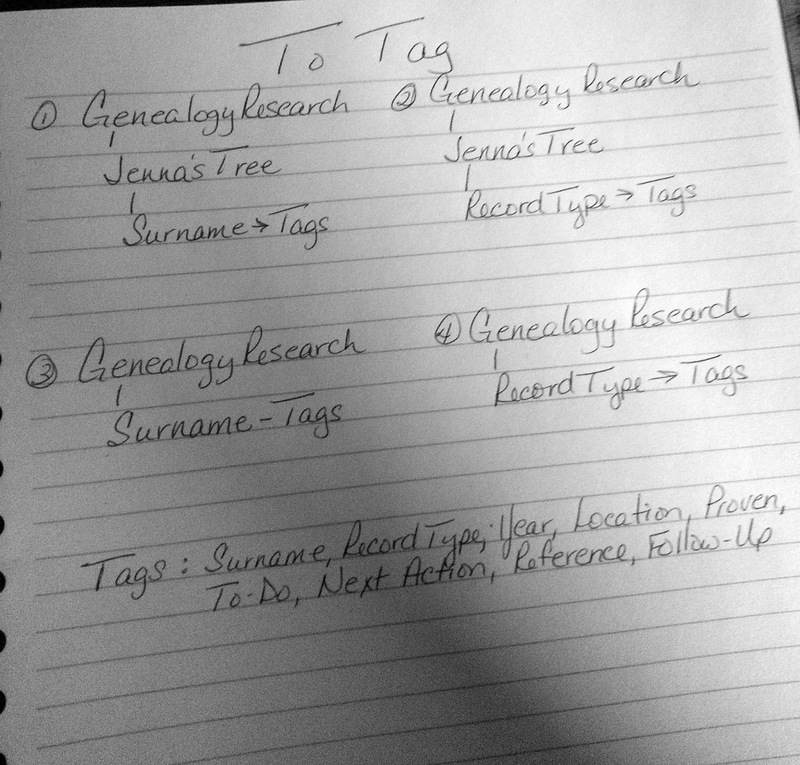 Then each death record would be tagged with the surname and I could search for the surname tag. Do I even need a Deaths folder? I could tag all my documents: Death; Surname; Year; Location. Some may also wonder why I have two systems, so to speak. Evernote is how I capture my information. If you are familiar with GTD you will know what I'm talking about. Based on the way I research, I capture first then process. While it may seem redundant to have a copy of something in Evernote and in my windows system, that is the one part of this that I know works well for me. And to clarify just because a document is captured in Evernote it doesn't necessarily make it to my windows system. I'm afraid my minor OCD is not going to let me go completely folder-less but I do like that idea. This is going to be a fairly big job to switch my entire digital filing system. Also I am only talking about my digital filing system. Any thoughts on where I might run into problems with this line of thinking in going heavy on tags and very light on folders?